Lawns are the common feature of private gardens, private landscapes and parks in many parts of the world and are made for aesthetic pleasure as well as for sports or other outdoor recreational use. These provide cushion in sports such as rugby, football, soccer, cricket, baseball, golf, tennis and hockey. The lawn has become a central element in landscapes. Turfgrassculture, is a multi-billion dollar industry in the world. Turf grasses provide recreational health benefits, enhanced property values, a draw for golf tourism, and important ecosystem services including heat dissipation, soil carbon- sequestration, soil erosion control, dust stabilization, reduced noise, glare, producing oxygen, reducing temperatures through cooling the air and water run-off, when compared with impervious surfaces. The present book on ‘Lawn Development and Management’ is written with 14 independent chapters. In an introductory chapter history and definition of lawn and importance and uses have been made to provide useful and complete information on genesis and scenario of domestic and international uses. 12 interesting chapters on preparation of site and soil, types of lawns, cool season grasses, warm season grasses, methods of establishments, water management, mowing & rolling, thatching, aerification, fertilization, weed management and management of insect-pest and diseases in lawn development and management are discussed in useful way. 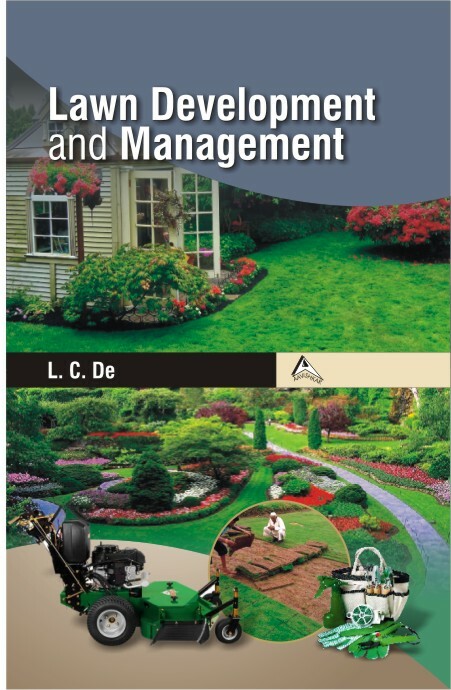 It may be humbly claimed that this is the first most comprehensive book of its kind on ‘Lawn Developmentand Management’. This book will be useful to teachers, students, scientists, nurserymen, landscape architect, amateur and professional gardeners, and above all progressive hobby growers.